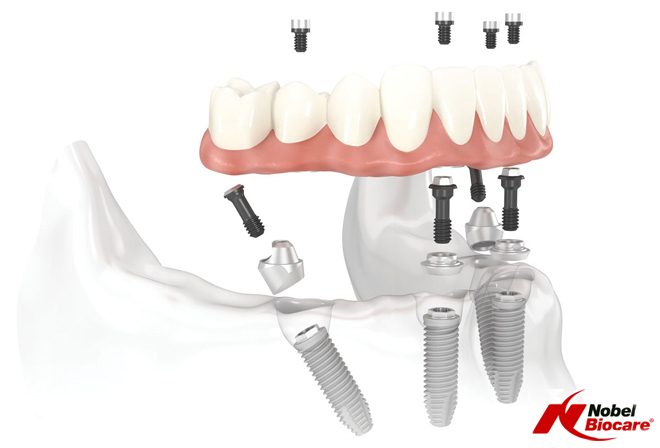 The All-on-4 treatment concept was developed to provide eligible patients with an efficient and effective restoration using only four implants to support an immediately loaded full-arch prosthesis. The real appeal is how quickly permanent implants can be placed, so that patients can leave the same day with fixed, non-removable replacement teeth. This treatment is attractive for those patients with dentures or in need of full upper and/or lower restorations. With fixed teeth in a day, the patient has one or two planning visits to allow the Oral Surgeon to gather information for a comprehensive treatment plan. These include a 3D CT Scan, X-Rays, jaw relation records, impressions and photos. Following this consultation, the patient is scheduled for surgery implantation and the new teeth are fitted and adjusted, all in one day. A brand new smile in just one day! Copyright © Darren Kelsey Clinical Dental Technician. All rights reserved. Have you got any questions? Fill in the form below and a member of our team will be in touch as soon as possible.